Amid seemingly endless stacks of boxes and an array of random items—unused medical supplies, old towels, a sheet of plywood with over 50 stuffed bears haphazardly stapled on—Nicolette Stosur-Bassett shows off a colorful mermaid costume that, she said, was part of “one of the best clothing donations” she had seen in the past year. Stosur-Bassett, 23, is the Director of Outreach and Development for Film Biz Recycling, an organization based out of Gowanus, Brooklyn that aims to find the best “second life” for items that would otherwise be discarded from the film, theater and production industries. 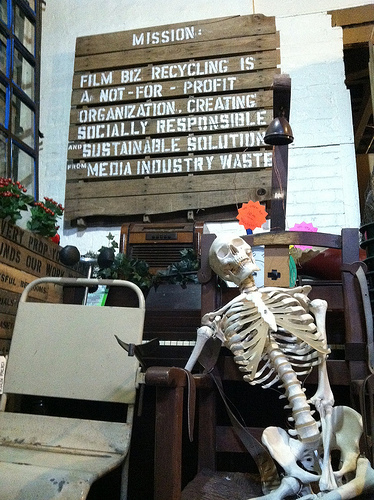 For Film Biz, this means recycling, donating, selling and a creative reimagining of would-be discarded items. These armchairs are a donated set. 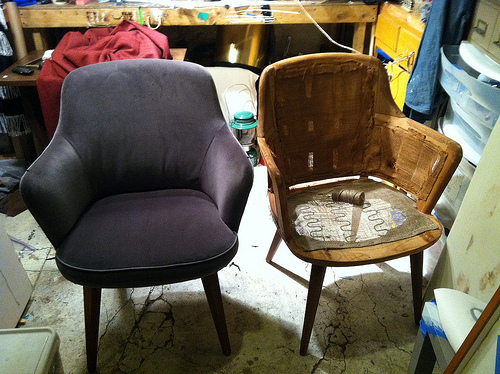 The one on the right has yet to be up-cycled, the one on the left has been completely refinished with donated materials. By Alyana Alfaro. Because Film Biz earns most of its operating budget from resale of donated items, last year, the organization started a new “creative-reuse” initiative to help move and sell some of the “less-desirable” things. 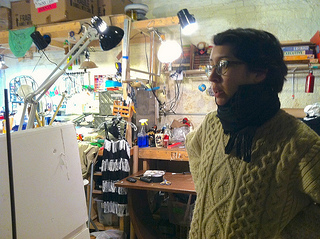 Juliana Obyrne, 23, is a professional up-cycler. She re-imagines donations to create new items to sell. By Alyana Alfaro. According to Hirschler, wood furniture makes up about 50 percent of the reusable material that is often needlessly thrown away and another 20 percent is comprised of old textiles. For Hirschler, up-cycling and resale of old items is a logical step to significantly reduce that number and, therefore, carbon emissions. Though Film Biz Recycling is not affiliated with the city of New York, Hirschler said the mission of the organization and others like it jive perfectly with the work of the NYC Center for Materials Reuse, a DSNY project dedicated to optimizing discarded materials. For Bao-Khang Luu, owner of Releve Design, instructing New Yorkers on how to make items out of every-day discards has become a primary business component. In addition to creating lamps out of items like soda can rings, Luu creates DIY tutorials in the hopes to make people realize that up-cycling can be both fun an economically-savvy. According to Stosur-Bassett, the interest in reuse among New Yorkers is a trend that seems here to stay. T-Shirt to Totebag Tutorial from Pavement Pieces on Vimeo.